An outstanding luxury executive home set in Grand Reserve, a private gated community of upscale properties, bordered by Lake Thomas, a conservation area and mature trees. This spacious 2,560 sq.ft. living accommodation] luxury home enjoys beautiful uninterrupted views over the conservation area and beyond. The property has been professionally furnished to the highest of standards. With Games Room. 100% private pool area. There is an outside patio with sun loungers, table and chairs. Three master bedrooms all have en-suite facilities Twin Bedrooms share a bathroom All have hairdryers. TV. Very large kitchen with centre island work area. Breakfast bar. All equipment you would need. This exclusive home comprises: * One level living * Two Master bedrooms with en-suite, King-size beds, TV, phone * One Master bedroom with en-suite, queen-size bed, TV, phone * Two spacious twin bedrooms, sharing bathroom, TV/VCR * Formal Living & Dining rooms * Large Family room leading out onto pool, with 48' LCD TV * Very large kitchen, fully equipped with breakfast nook * Separate laundry * Screened heated pool/spa 27' x 15'[child alarms fitted & net] * Outside patio with loungers. * Games area with pool table, American football table, electronic darts. Turbo Hockey Table. * Extra large sun deck with covered patio, ceiling fans. * Three car garage AMENITIES: 4 phones, air conditioning, 8 ceiling fans, 6TV's with cable, DVD player, lighting, private pool/spa, Microwave, dishwasher, refrigerator, fully fitted kitchen, washer, dryer, iron & ironing board, cookware and utensils provided, linens & towels provided, hairdryers all bathrooms. Amazing Holiday!! The property was very nice. My family really enjoyed it. Amazing property, awesome holiday! Villa was of a good standard and was very spacious and clean. 4 adults 3 children stayed and it was spot on what we needed. Pool and outside area was particular highlight, loads of space and a large pool with wonderful views across the lake.....would return to this villa and would definitely recommend! We spent 2 weeks in this fantastic villa. The outside space was excellent and all 7 of us where able to sit outside every morning for breakfast. The house has everything you need and while this is not the first thing you think of going on holiday the washing machine and tumble dryer where great!! 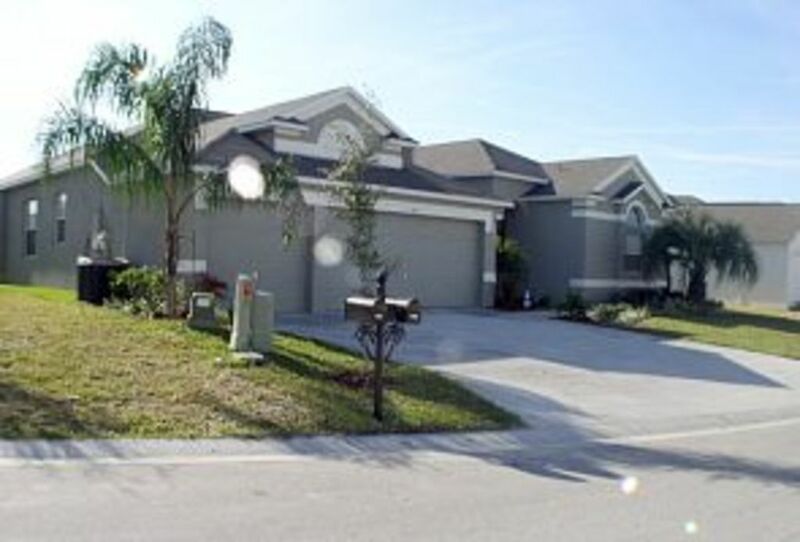 It is also a great location being about 5 min from a publix supermarket, also nearby is a great Applebee’s, and an IHOP, we also discovered a great steak restaurant called Ovation about 15 mind drive from the villa. Everything was within easy reach of the villa and we loved coming home every day to enjoy sitting outside and enjoying the sunset over the lake. Brenda, the villa owner, was very helpful and prompt in answering any of our queries. Loved it! Spacious/comfortable/All the amenities you need. A very good all round villa. Beautiful outlook from private pool deck to small conservation area at rear of house. Loads of room to spread out throughout the house. Will consider it again when we go back to Florida. From day 1 we had trouble with the neighbours ( they live in the property next door) there was loud rock music and abusive language being shouted . they continued from friday afternoon till sunday (reported this to owner and management company ).On the saturday we sat in the pool area eating lunch when 2 of the neighbours walked their dogs right past our pool area about 20 feet from us and stood there while they pooped ( not nice to see especially when eating lunch )We went out on sunday ( to escape the noise ) when we returned the air con was broken ( house was 90 deg ) tried for 5 hours to contact management company but no answer . We booked 2 days out of property at our expense to escape the heat in the house . The house itself is a really good size but it was in need of repair, kitchen cupboard doors are peeling off and look unsightly , the carpet has moved away from the grippers leaving pins sticking up ( our son cut his feet on them ) . The doors in the property are dirty there was what look like food debris on the wall , the bedding was stained and not the right size for the bed as it was tied in a knot to make it fit. The skirting boards are dirty all along the top and the shower curtains are stained . There was a broken plug socket which was very dangerous . The games room was way too hot to use even the management company when we eventually saw them had to open the big garage door before they could try and fix the air con unit in there . The patio furniture is dirty and had sticky substances on them and is looking worn. Had no help from management company and tried to contact owner on our return to discuss these problems ,even sent the owner numerous pictures of our concerns It has been 6 days and still no reply ..
We understand that the owner is at the mercy of the management company and cleaners etc , and may not know of the condition of their villa ,but a reply to my emails would of been nice . A very spacious house with a good pool which is very private. Good location for accessing Disney sites etc. We previously stayed here 5 years ago and were pleased to find the natural area to the rear of the property has been opened up allowing us to enjoy the wildlife. We had a very relaxing time at the house and enjoyed the pool especially in the very hot weather! We did feel that it might be time to replace the outside furniture as it’s now not very comfortable. We agree with a previous comment re provision of basic items and would happily have put the bedding on to wash when we left but there wasn’t any detergent. Most vacation homes have Palm Casual outdoor loungers, as they can withstand the climate. We have double the loungers provided by most villas. We provide dishwasher tablets and complimentary soaps. As we pay for a clean after each guest, we do not expect them to have to do the washing before they leave, after all it is their holiday. An ideal location 5 minutes drive to Champions Gate, where there is a PGA Championship Golf Course, designed by Greg Norman, also a 24 hour Publix, Restaurants, takeaways and a video/DVD rental outlet. A 12 minute drive to the Disney Theme Park Gates. There are plenty of restaurants to choose from on the 192, which is 8 minutes away. The close proximity of the I-4 gives easy access to Universal, Sea World and the Shopping Malls.